History shapes us all. Even though I was born after WW2, I was affected by the events of that conflict. And so I know that fictional characters will also be affected by their world’s history. In my worldbuilding for my WIP Tiberius Base, the Terran Empire that most of the characters are part of is not a real empire with a central governing authority. The planet Earth is called Oldearth with a certain degree of contempt, because the world has gone silly due to the continuation of anti-overpopulation measures into a time when the planet is facing an underpopulation crisis. The Terran Empire consists of a bunch of different authorities based on different colony worlds. The Emperor of the Empire, called the Asian Emperor because he unites the royalty of several Asian nations in his family tree, is a figurehead and knows it, but ‘rules’ out of some royal palaces on Oldearth. The pope also is based on Oldearth but most men who rise to that position worked on Terran colonies before becoming Cardinals and later Popes. Terrans are part of a very loose group of humanoid races that maintain the Interstellar Archives. The Archives rate differing races as to their dominance level. A race that is considered submissive is not allowed to colonize whole worlds but must be content with being given a continent to settle on some other race’s world. The Archives determine which colonization projects are allowed/accepted but have no warships to stop an unapproved project. There are two humanoid races that play a part in the story. The Menders have been visiting Terra since the days of ancient Egypt, usually to buy horses to add to their own breeding stock. Terrans and Menders are usually allies. The Lizards, also called Ulangin, are a problem. A Lizard is making a claim to the whole of Tiberius Base, because the Base’s core is a hollowed-out asteroid provided by a mysterious true-alien race called the Diggers. The Lizard has permission from the Archives to study Digger artifacts and so he claims the whole Base. Ping, the main character, and his boss, Master Liang, are from a political entity which grew out of Communist China. They are ideologically Communists and Scientific Atheists, but their main business is business and their ideology isn’t allowed to interfere with that. The core of the story is that these atheist men decide to import Christianity to use as an instrument of social control over the workers they are bringing in. The calendar used in the story is the AD calendar based on the approximate birth date of Jesus Christ. The year of the story is about 3227. I think. Haven’t worked that out much yet. Or much of the history. I do know that the United States no longer exists, but the American idea of self-government and God-given rights live on. People who believe in these ideals are called Americans even if none of their ancestors were US citizens. The most American of the Terran worlds is called Mayflower. Some of the workers at Tiberius Base are to be imported from that world. Mayflower is divided up into states, like the United States. Some states are founded by distinct groups but the lines blur as people move to other states. Two states are full of alien immigrants, who adapt fairly well to the American way. One unique group on Mayflower is a group of German-Americans who happen to mostly be people with African-dark skin and blond, tightly curled hair, as a result of a group of children of this ethnic mix being prominent among early settlers. These are among the people imported as workers to Tiberius Base. The other workers, also German speakers, do not see anything odd about the brown skins. But some don’t like that they speak German ‘funny’— influenced by an Amish dialect. Rebekah Loper who leads the Worldbuilding Wednesday blog hop has given some suggested questions to answer and for a change I am not ignoring them. What historical event has lead to your inciting incident? The inciting incident is when Master Liang assigns Ping to obtain a crowd of workers for the station. The whole history of planetary and space station colonization plays a role in this, and not just the history of Terrans. It has become the custom for brokers to ‘sell’ groups of workers for colonization projects. The workers are tested for fertility, rated as to useful job skills, and the languages and trade languages they speak are noted. The groups are given monetary values based on many factors. Some groups, like the Amish, are highly sought after because of their primitive-farming skills and their ability to form tight-knit communities. What historical event has most affected your character’s life? My main character Ping is an ordinary citizen of the Interplanetary People’s Republic. The history that has most affected his life is the custom that has developed of providing boarding schools to train young workers so that parents and grandparents are freed of child care duties. (Today in China workers find jobs in the towns and their children are raised by the grandparents in the countryside.) Ping was parted from his parents in that way and has learned to look on his work superiors as father figures. So, does a space station actually have a geography? Well, Tiberius Base is pretty big, so, yes, it does. It’s a space city, really. 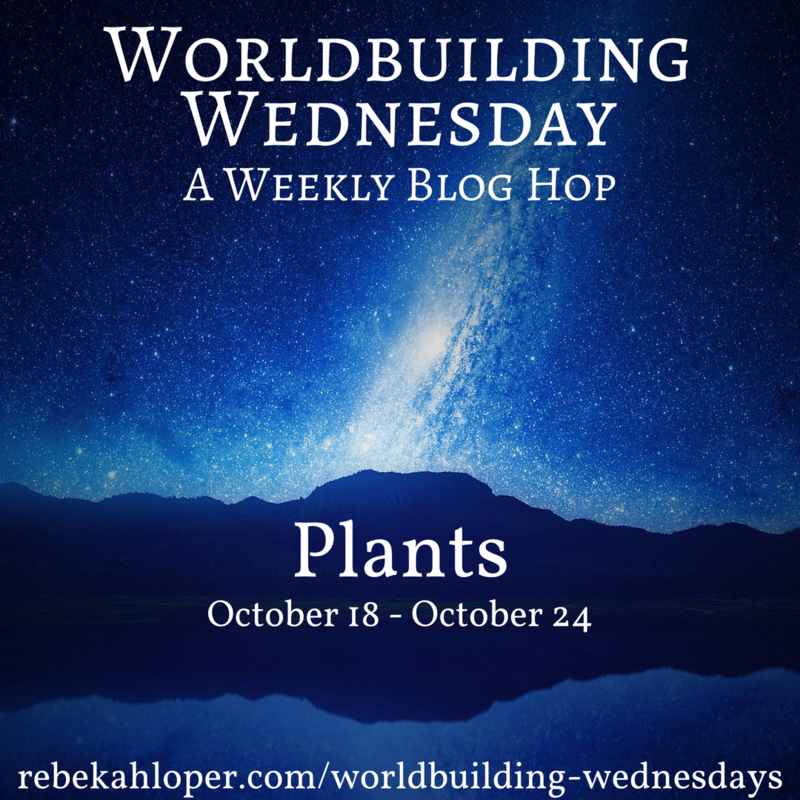 This is a post in the Worldbuilding Wednesdays blog hop. Join us! The core of the Base is a hollow-out asteroid donated by The Diggers. The Diggers are a True Alien race— not humanoid— and they are classified as Fernal Aliens. In other words, they can’t or don’t communicate with humanoids normally. But in this case there is another alien race, the Tsanan, who are Bynal Aliens— they do interact with humans— and they are able to communicate with the Diggers. The Core is the center of the Base but it is covered in artificial constructions. The Base is in levels and has artificial gravity emanating from the bottom of the sphere. I might mention that in my current WIP Tiberius Base is in the late stages of construction and a lot of the interior is still being build or adapted for its intended used. Tiberius Base is built and owned by the corporation Fortunate Dragon, which is based in the Terran Empire, in a subdivision ruled by Chinese people. There is a double-ring of docks around the ‘equator’ of the station, where ships can refuel, undergo repairs, or trade cargo. At the Docks level, most of the facilities are related to trade or repair, as well as lodgings for those who are visiting the station. There are also security officers aplenty, because there are also some spacemen’s bars being set up and trouble is anticipated. This is the ‘top’ of the station although designations like ‘top’ and ‘bottom’ are arbitrary. Topside is where the well-to-do will live and work when the Base is fully operational. A home in Topside is considered very exclusive. The rooms don’t just have many rooms. Most have their own gardens build in— and they are not practical gardens, but are filled with difficult-to-grow exotic flowers, usually. Though one eccentric grows nothing but varieties of day-lilies in his. A few of the more posh spots also have a second garden for the practical purpose of growing herbs and vegetables for the kitchen. The Topside shops and restaurants are the most desired locations and people of all levels of the station use them. It is a tourist attraction really. There are a lot of transparencies (like glass but tougher) so you can see out into space. There is also a grand colored transparency like an abstract stained glass window. My main character Ping was in charge of the project of installing the transparency. The Dome area leads into Midside’s ‘downtown’ area. It is also the entrance to the ship’s forest. Bottomside is dedicated to the most practical operations of the base, like the sewage system. There are also the homes of the menial workers. These homes are NOT posh and there are actually barracks for the unmarried workers. The only shops and restaurants at the Bottomside level are a few cheap places that cater to the poorest. Most Bottomside residents shop and eat at Midside. The station management makes shop spaces available there at low-enough prices that most folks locate businesses there. 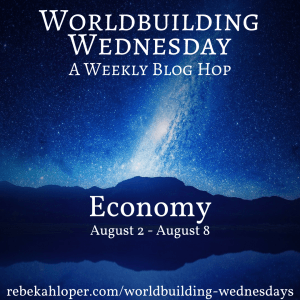 Worldbuilding Wednesday, a weekly blog hop by Rebekah Loper, is today, and our topic is the Economy. Economy is an all-important topic in worldbuilding which is often neglected— who wonders how Frodo managed to pay Samwise? But I’ve only just written a post about the economic collapse caused by the zombie apocalypse which happens in the third book of my as-yet-unwritten Revenant Nation series. So I’m narrowing the focus to one aspect of the new economy— feudalism. Because if you don’t own land or any form of wealth when the Zombie Apocalypse hits, all you have is your labor power to sell. The new wealthy of the Zombie Apocalypse world are the people who control food resources— farmers. Imagine a typical dairy farmer in Menominee county, Michigan— there are a few such farms within walking distance of my house. They will still have their herds once the Z.A. hits— but lack of fuel and electricity means that they will be needing greater supplies of labor. Human beings who survive the zombie carnage in the cities and larger towns will need work to provide food and a place to stay. It is almost inevitable that arrangements will be made, trading the labor power of workers for a place to build a cabin and a supply of food. The workers will be at first fully unskilled— how many people know how to harvest grass for hay using a hand scythe or even a horse-drawn hay cutter? But with practice the survivors will become skilled peasants of the European type. The farmers will be expected to supply some of the food needs of their workers, perhaps giving them a cut of the milk, butter and cheese harvested. But the new peasants will be expected to produce some of their own food through gardens and the like. I have read that in Ireland the peasants subsisted on their potato crop plus what they got from the family cow. At least until the potato famine came along. Although a diet of potatoes plus butter, milk and cream is nutritionally horrible— too many carbs— it was able to sustain life. The new peasants of the Z. A. world will likely have to discover a similar way of basic subsistence to survive. The wealth of the farmers will depend on how near they are to transportation of their goods to a market. Some farms— cultivated by the military to feed the troops— will be supplied with fuel and operate in a nearly normal method. Other farms, without the market, will mostly be about feeding their workers. At first, most of the purchases people make will be in the form of barter. Perhaps some people will be able to install solar or alternative electricity in exchange for long-term food supplies. It will probably be a few years before a stable currency is reestablished. In addition to food and/or a chance to produce one’s own food— one can’t garden without a home to garden from— a farmer will probably have to provide a degree of protection. The Z. A. world will likely be full of would-be Negans who would love to enslave other people. A farmer who arms some of his trustworthy male workers would be able to fight off most threats of that sort. New peasants choosing a farmer for a ‘master’ would take into consideration the ability of that master to protect his workers. Worldbuilding Wednesday blog hop: DEATH! Large numbers of zombie corpses are killed (or should that be re-killed) by shots or blows to the head and are then left somewhere— often a paved area— to dry out during warm days of summer. When they are dried out somewhat the corpses are burned. Mourning procedures change depending on if a person died of the infection, turned, and killed people as a zombie. Some communities ban the wearing of mourning bands for someone whose corpse killed people as a zombie. Others use a charcoal gray mourning band for such cases. People in the Judeo-Christian faiths tend to not blame the dead person for what his corpse did as a zombie, but are concerned about the feelings of those who lost family members to zombies. Spiritual aspects: among religious believers with afterlife beliefs, a person is held to have died and his spirit gone into the afterlife at clinical death. The zombie that may arise from his body is considered its own entity, more animal than human-like. IT is widely believed that a person is not responsible for evil actions performed by his zombified corpse. Anti-religious types like those in the Rosa party often insist that the zombies are not risen from death, that they are the same person they always were only with brain damage. 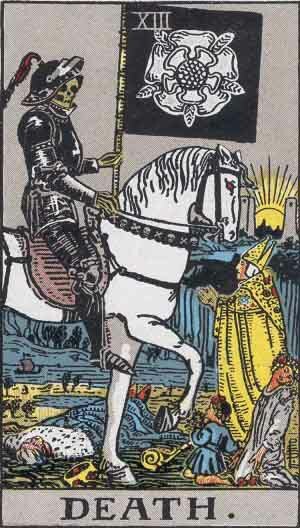 They are wedded to the idea that humans have no soul and that nothing happens after death. Which is why Rosa ruled regions can’t cope with zombie infestations effectively. 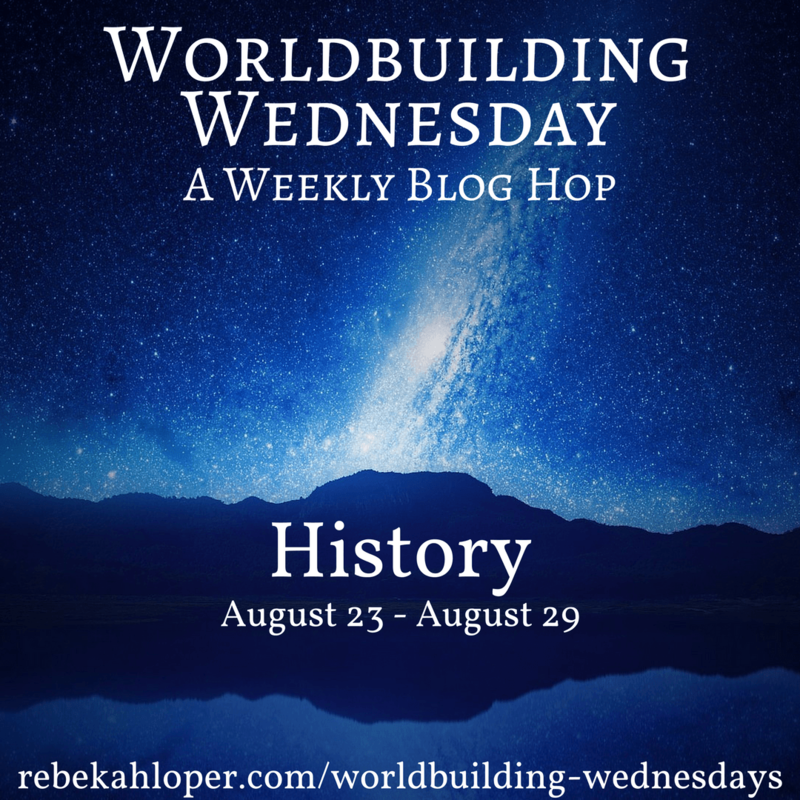 This has been a post in the Worldbuilding Wednesdays weekly blog hop. It runs from July 26 to Aug. 1. If you are an author currently doing worldbuilding, it’s a great opportunity to get inspired to do more work. 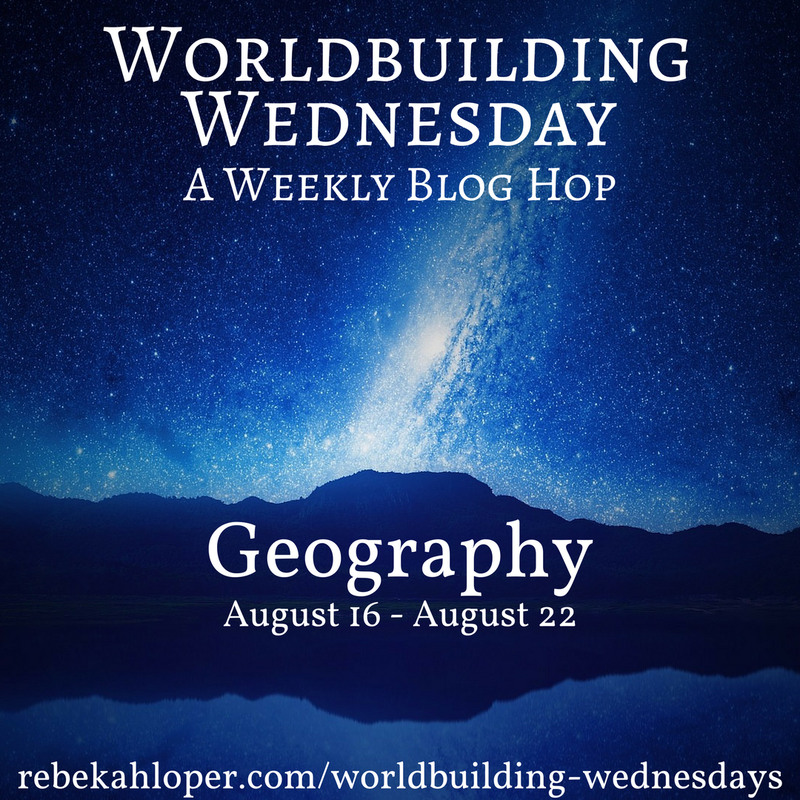 Join us at http://rebekahloper.com/worldbuilding-wednesdays/ and sign up.